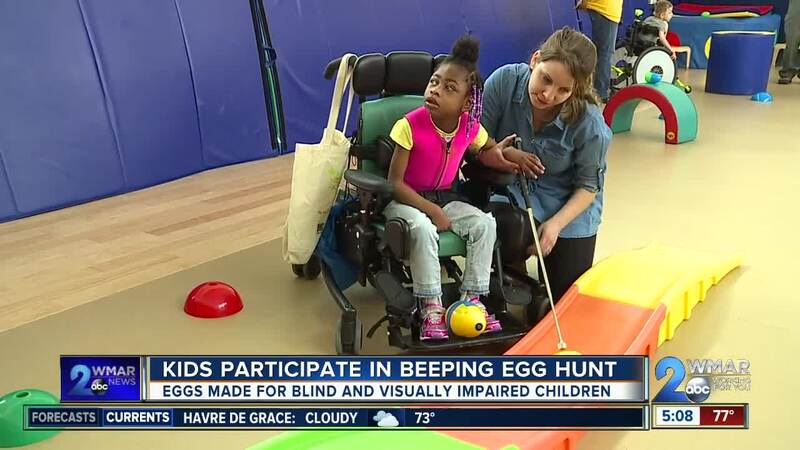 Maryland School for the Blind holds their 41st annual Easter egg hunt using beeping eggs. BALTIMORE, Md — It's a tradition that every child should be able to enjoy. Beeping eggs are used to give children who are blind and visually impaired a chance to participate in Easter egg hunts. Tuesday they were used in the 41st annual hunt at the Maryland School for the Blind. The eggs were built by an agent of the Bureau of Alcohol, Tobacco, Firearms and Explosives who has a visually impaired daughter, with the help of local bomb squads. They give off a high pitched beeping sound, similar to a watch or an alarm clock. This allows students to easily hear the noise and find the egg." "It just brings us great joy to see these kids having this opportunity to play and participate in this special annual event that we all take for granted so often," said Rob Hair, Superintendent of the Maryland School for the Blind. "But these kids find it very special." At the end of the hunt, students were able to trade in the eggs for books, toys, and treats.